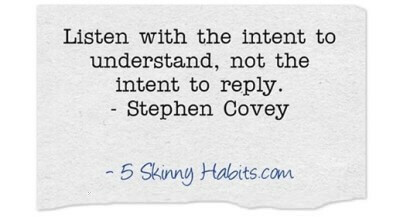 When you have a conversation, are you more interested in being heard or listening? I bet, if you don’t consciously try to listen, you will most likely be planning what you are going to say before you have even finished listening to your friend. Since both parties are doing this, the chances of a meaningful or effective communication is close to zero! Everyone is more interested in getting their point across. But when you actually listen, the other person feels like you are connecting with them. Your friend will feel like you empathize and be more open to accepting your opinion. This makes you a more effective communicator and most likely influencer. So besides for being polite 🙂 , if you listen to a friend talk, you may actually have a chance of getting your point across.